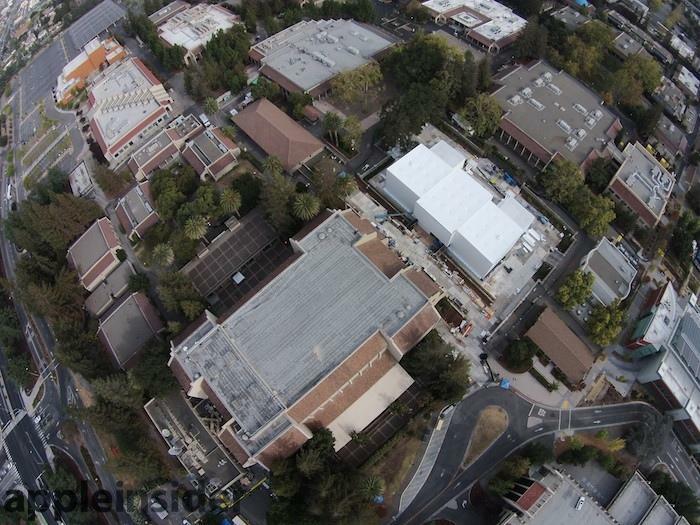 Not too far from Apple's Campus 2 project, a temporary structure is rising for the company's September 9 event, and new aerial shots captured by an amateur photographer using a flying camera drone offer a closer look at the mysterious white box that has generated considerable buzz. 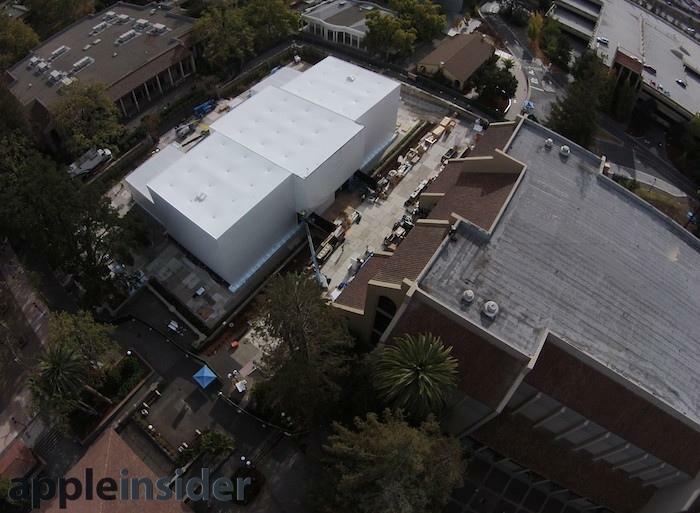 The large white structure is being erected next to the Flint Center for the Performing Arts, on a square within the De Anza College campus in Cupertino, Calif., which is located just 1.5 miles from Apple's Infinite Loop headquarters (or nearly equidistant from Campus 2). The included photos and video were captured by a DJI Phantom 2 Vision+ drone, offering a unique perspective on the mystery building. Apple's 3D Flyover in Maps depicts the site as usually being bare pavement encircling two patches of grass and a central fountain. Overhead images (below) reveal that the fountain is still exposed in the rear, while the front courtyard area is enclosed in a large, ventilated temporary structure. 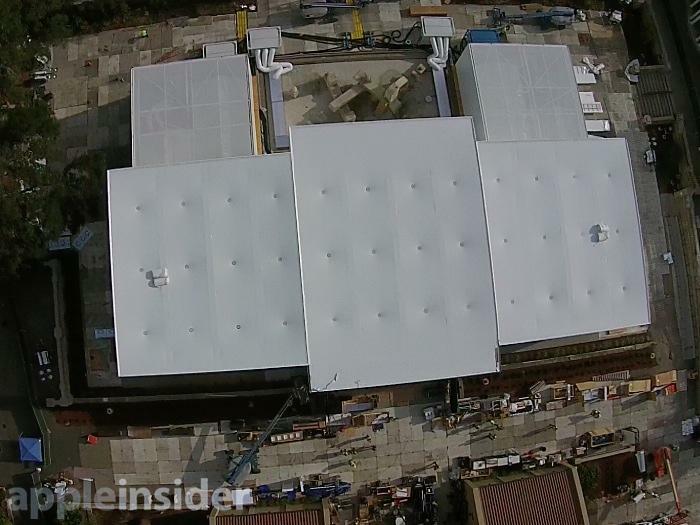 Many have speculated that Apple built the structure as hands-on venue where event attendees will be able to inspect the new products it releases, which are expected to include iPhone 6 and, according to rumors, a new wearable product category. Building large temporary structures is common among large companies hosting major events. Oracle pays to build a large pavilion used to feed attendees of OracleWorld in the middle of a major downtown street in San Francisco, an effort that requires repainting lane markers and redirecting traffic. Google similarly attempted to build a large temporary structure to showcase Glass via a floating barge, but because the project ran afoul of environmental and planning regulations, the company was forced to tow its barge out of the San Francisco Bay and to the remote outpost of Stockton, where the structure is being dismantled. Other barges in the program were also scuttled without ever being used. Apple hasn't used the Cupertino Flint Center venue for introducing new products since the late 1990s. The space is notable in Apple's history for serving as the first public introduction of the Macintosh in 1984. The Flint Center auditorium has the capacity for seating nearly 3,000 people, compared to the smaller Yerba Buena Center for the Arts Theater in San Francisco, which seats only 755 but has served as the venue for unveiling iPods and iPads in the past. Last fall, Apple presented its new 64-bit A7, iPhone 5s and iPhone 5c at an event in its own theater at the company's Infinite Loop headquarters. It then followed up with an event for new iPads and Macs at Yerba Buena. This May, Apple's iTunes head Eddy Cue remarked "later this year, we've got the best product pipeline I've seen in my 25 years at Apple," adding, "I believe the products we've got coming are great."